In the latest issue of Empire Magazine, Director Christopher Nolan has said for the record, while he is in charge, he won't be bringing the Joker back into the Bat movie-verse, ever. Straight from the movie-mag itself: “No”, says Nolan emphatically and unhesitatingly. He resists elaborating simply because, quite understandably, he says, “I just don’t feel comfortable talking about it”. Now that is a sign of class. 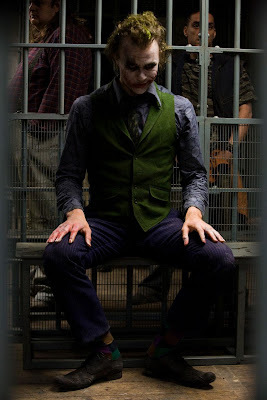 The late Heath Ledger's Joker is a seminal performance, and while it may be good for the odd round of voice impersonations, having someone else become the master of the 'disappearing pencil', would be an unfunny move, even to the Joker himself. I totally agree. Trying to replicate the Joker with anyone else would be foolhardy. Heath Ledger nailed the character perfectly. Lets leave it at that. So who will the next villian be? That's the million dollar question Jonny. While I'd love my favourite - the Riddler - to take the spotlight, I think we could be looking at Catwoman, plus one of the lesser known rouges like Hush. Who does everybody else think?